Install video actuation to detect the end of the queue on the eastbound Litton Lane approach to the KY 237 (North Bend Road) intersection. Adjust signal timing as needed for clearing of Litton Lane queues within a single traffic signal phase. This recommendation will provide sufficient signal timing to clear the long queues of traffic on the eastbound, Litton Lane approach to KY 237. 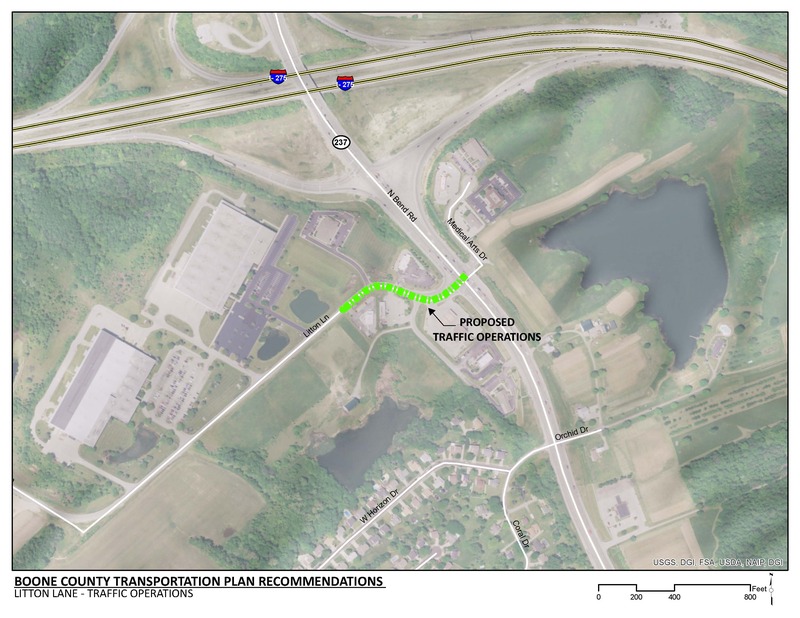 This project will increase traffic flow and help reduce the amount of time that Litton Lane business entrances are blocked by the eastbound queues of traffic. The signal timing on Litton Lane will need to clear queues without significant impacts to the KY 237 signal system. At the signalized Litton Lane intersection with KY 237, there are long queues of traffic resulting from a high volume of eastbound left turning movements from Litton Lane onto northbound KY 237. Although dual left turn lanes are provided on the eastbound approach, most vehicles are traveling to I-275, resulting in disproportionate use of the outside (most southern) left turn lane. The queue of traffic at the eastbound, Litton Lane approach to the signalized intersection with KY 237 often blocks entrances to businesses along Litton Lane. Litton Lane serves a mix of industrial and commercial land uses. Freight logistics of the distribution facilities along Litton Lane generate a demand for both long and short term truck parking. Since truck parking is limited in this area, trucks are parking in nearby private parking lots and along the shoulders of the roadway. The additional weight of the trucks in these locations has led to rutting and potholes in pavement that was not designed for this purpose, nor the weight of trucks. There is an active Boone County project to install sidewalks along existing Litton Lane. TANK fixed route 39x runs along KY 237 and through the intersection with Litton Lane.